I used a few pixel poi before. This seems to be the closest to the weight and the feel of my contact poi. So these features makes it quite easy to use there from my professional perspective as the contact poi spinner. So yeah, I think with these particular adjustments to this set of poi that would be ideal for me to juggle tricks with pixel poi and performance. Best pixel dragon staff I have tested so far. A lot of fun doing this photo shutting session. And it survived to 3 crash tests. Well done Ignis! I've been having pixel poi from Ignis for around 5 years. The first one I got was 160 HD. 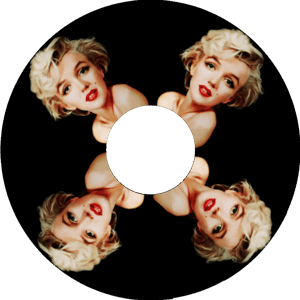 And I really love it because you can create many different patterns, you can put into them images of faces and everything. And now I got these new poi 80 HD Tech and they are amazing to juggle, to do any king of isolations, antispins, is the best ones to practice. I just got it yesterday and it was wow. This is like the best poi in the world! The system of pixel product is awesome. 10 of time lines and 80 picture which work individually. Every time I give them feedback, they answer it and updates very quick. I am sure it will be much better than now in a year or so. Ignis updates software and make your poi as brand new poi with adding more functions. Look forward to seeing what Ignis bring us next updates. I bought a pair of Ignis 160HD-Pois end of last year I still like working with them a lot! they where the first ones with the high-resolution-pois and they came right on time for a great foto-shooting and some jobs. the service is great, I had a few problems, but the team always did help me to solve them! I'm looking forward to more coming up (music-timeline!?) - glowing greetings from Berlin! Recently I orderded pixel poi, I had numerous questions before ordering,I asked all of them and they answered them promptly and patiently. I had a problem with money transfer (money was deducted from my a/c but didn't reach ignis but after 24 hrs problem got solved by paypal) and we received the poi within four days and we had another problem; one poi was working but not the second one we again contacted support, they came online in skype and helped us to repair it. I was really very happy with this after sales service. Now both pois are working very well and I'm even performing it full pledge. As per my experience this is a great product from ignis poi and I'd prefer giving 5 star rating. I thank to ignis team for their exceptionally good support. I bought the 160 HD LED Poi -the service? - Thumps up! Effect on the audience - brilliant, fantastic - the hardware looks durable. The software is very simple. 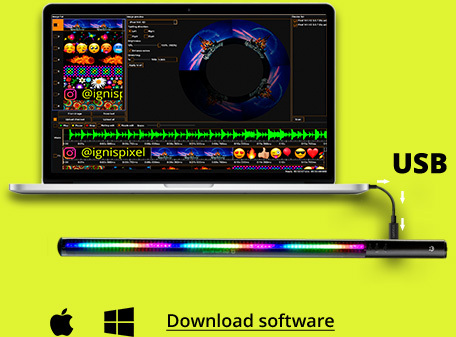 Ignis Pixel are professional poi with the highest resolution available on the market, developed by Russian engineers in Ignis company. 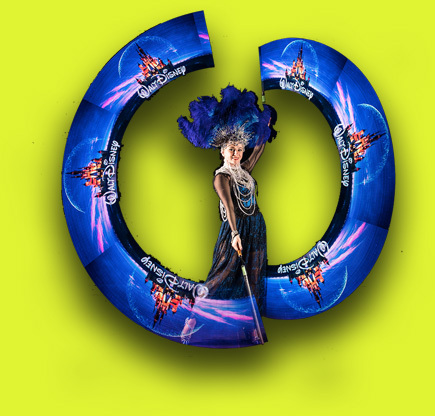 With Ignis Pixel you will expand your creative limits, reach new skill levels, and create brilliant shows that surpass expectations of audience. The key to success is simple: with digital poi Ignis Pixel your LED's performance will be No.1. Digital poi are LED sticks that draw custom pictures in the air. They become the powerful tool for creating dazzling visual performances. 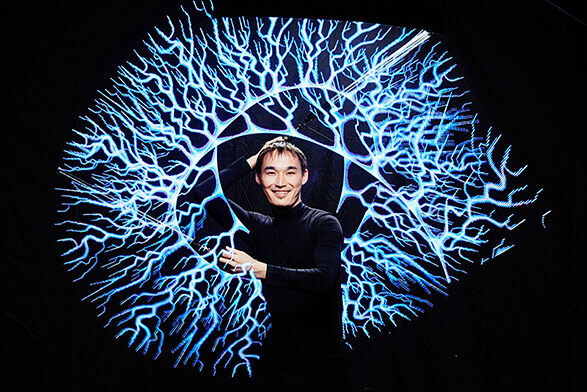 Performers spin digital poi and make juggling tricks with them. Human eye has visual inertia called Persistence of Vision (POV). It allows to see trails of poi in motion. Poi’s LEDs change their brightness and color at certain moments and hereby draw picture in the trail of poi that is visible for human eye. 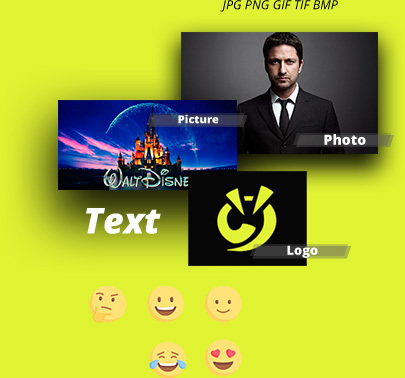 Any custom pictures and photos can be loaded into the poi from computer through USB. Try our software for digital poi on your PC now. It's free. The case of digital poi is made of sturdy polycarbonate. This material is used for police shields and bulletproof vest. We use special wide-angle LED technology that gives uniform light distribution in all directions and prevents the appearance of 'black gaps' – dark areas in visual trail - when the poi's LEDs are oriented side to viewers. We use in our poi high-quality light-emitting diodes that is used for LED screens. Each poi contains quartz clock inside and work with high time precision. Once synced different poi will stay synced for long time. Battery and all critical points have reinforced soldering. You can be sure that regular bumps of poi will not shut down poi, timeline sequence will not reset and your performance will not be disrupted. Ignis digital poi may heat significantly while operating full white with maximum brightness, but they continue to work properly. Loop handles for our digital poi are made of soft tubular climbing sling and thoroughly stitched. Many spinners said that our loops have much less finger irritation in comparison with leather loops. We use electronic parts and micro chips provided by trusted American and European manufacturers. The design of our poi contains ergonomic, appearance, the way how it feels and user-friendly software and firmware. 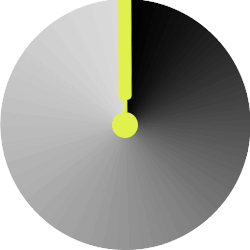 To switch poi on button must be pressed and released between 2 and 4 seconds that practically excludes accidental turning poi on during transportation. Spin in the dark. Spin in the twilight. Spin in the daylight. Maximum light flux from pair of poi is equivalent to incandescent lamp of 300-400 Watts. We recommend to use sunglasses when using the poi at maximum brightness. Experiment with images and get explosions of applauses! Full charged battery lasts several hours for most of pictures. Before turning poi off battery indicator shows remaining charge and reminds you to charge your poi if needed. Ignis is the world's only manufacturer of digital poi with the 256 dots resolution. Since 2010, we have been developing and producing professional equipment for fire and LED shows, and delivering it all over the world. Since we are the manufacturer and full production cycle is located in Russia we can guarantee the highest quality of our pixel props. This is why we give 2 years warranty for all models of pixel props, 30-day moneyback period and free technical services including free repairs during warranty period. No matter what the problem is, we will fix it. Not sure which model of Digital Poi to choose? Consult free with our expert. Please enter your contact info, and our expert will get back to you.